If you follow me on Twitter, you’ll have noticed that I’m in America for a few weeks. I’ve been spending part of the time here skiing up in Lake Tahoe, an alpine lake on the border between Californa and Nevada which Mark Twain called “the fairest picture the whole earth affords”. The clear air and the long blue views up here are good for the soul, but they seem to have a curiously retarding effect on the cooking. Many of the restaurants around the lake have menus which haven’t changed in the six or so years I’ve been coming here, but that’s nothing; there are a good few menus here which don’t look to have changed since the 1960s, when many of the properties here were founded, and Frank Sinatra (who owned the Cal Neva Lodge, a hotel and casino on the north shore) and his pals Marilyn and JFK used to drop in for a steak. Lew Mar Nel’s, at the Station House Inn in South Lake Tahoe (a note to Best Western, the owners: “The world’s largest hotel chain” is probably one of the worst tag lines you could have chosen), is one of these joints that’s been around since before they filmed the Godfather Part II a few miles up the road. Detective work centred around the drinks menu and the art on the walls (a Vesper and Dirty Martini are called Lewis and Nelson Martinis here, and splodgy oil paintings of vases of flowers on every wall have MARGIT signed assertively at the bottom right) suggest where the name might have come from back in the day, although there’s no trace of Lewis, Margit and Nelson left now besides the cocktails and pictures. The restaurant is built in a log-cabin style, with bare wood walls, a rustic log bar, and benches in the booths covered with a very slightly sticky burgundy velour. It’s all lit with wobbly orangey dimness, so any stains are well hidden. The menu is a historical record of steakhouses long vanished – all Wienerschniztel, peppercorn steaks, trout amandine and escargots – and Glenn Miller’s band warbles softly over the PA system. This might sound charming, and I’ll admit that I was coerced in by the retro menu, but it is not an unalloyed good thing. You’re paying heftily for the privilege of taking a trip in Tahoe’s equivalent of the Mr Fusion-ised DeLorean, and while a couple of hours channeling your youthful grandmother on a slightly pissed night’s jolly might be a giggle, it’s not necessarily worth the $100+ we paid for a meal and a couple of glasses of wine, especially given the food, which was of a quality that any self-respecting 1960s chef would have drowned himself over in the lake next door. In keeping with the retro nature of what’s on the menu is a retro method of ordering: although there are plenty of appetisers on the menu, you are presented on arrival with a cheese fondue with a hunk of bread – “fresh-baked sourdough”, they say, but it’s actually just a lump of commercial baguette par-baked in a factory somewhere else, and finished off in the kitchen – and a salad with your choice of dressing, whatever your main course choice happens to be, so those appetisers remain unexplored for all but the hungriest. The fondue is made with something the Americans seem to call cheese (at least, our waiter did), but which European visitors, or Americans who are familiar with the output of an actual cow, may balk at. It’s curious stuff; silky in the mouth with a low melting point (lower than that of, say, cheese), very salty, very umami and very rubbery when dripped on something cold and left to congeal. 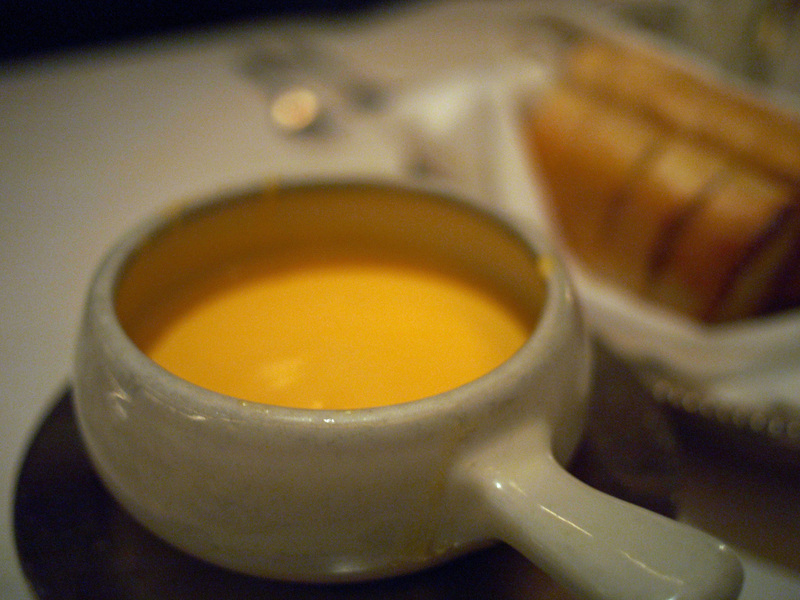 It is the yellow of motorway maintenance men’s jackets, and tastes almost nothing like cheese. 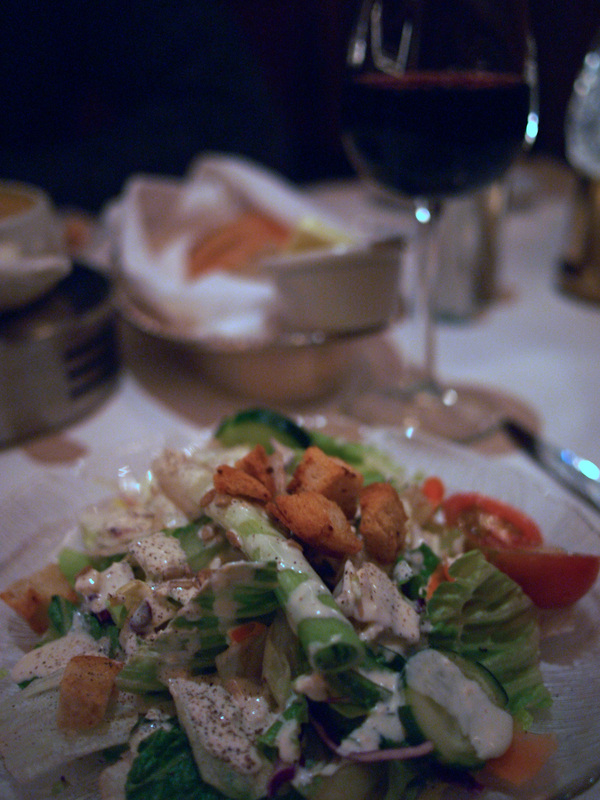 The compulsory salad was a high point; it’s hard to get a salad particularly wrong, and I am a fan of blue cheese dressing, which actually managed to taste cheesier than the nominally cheesy fondue. Garlic croutons appeared to have been made in the kitchen, and there was a certain charm to the moulded pyrex plate it all arrived on (I am a sucker for things which remind me of my Grandma, whose salads were lousy – getting them wrong might be hard, but she made it look effortless thanks to an addiction to Heinz salad cream – and always involved a pyrex plate). 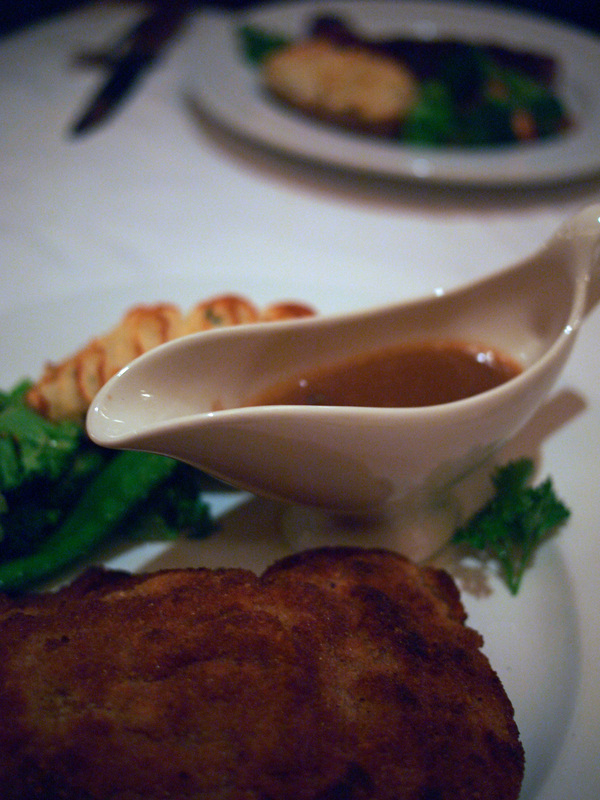 Veal cordon bleu, and what might just be the worst sauce ever conceived. I ordered the veal cordon bleu. When do you ever see a veal cordon bleu on a menu these days? It was overcooked and dry (the cheese and ham sandwiched inside it went some way to mitigate the dryness), and came with a little gravy boat full of what might just be the world’s worst mushroom sauce. Echoing the restaurant’s decor, this stuff was a glossy brown. And full of woody chunks of mushroom. Like the banquettes, which every now and then revealed a coin-sized spot of mystery goo to the palm you forgetfully rested on them, it was further enhanced by the occasional discovery of a slithery something on your tongue. And the flavour is hard to communicate in words, but reminded of that day when you were a kid and you confused chunks of leftover OXO cube in the kitchen for chocolate cake crumbs, surreptitiously swiped them, then honked everywhere. I will not mention the vegetables. Apple pie was a soggy affair, but at least it tasted of apples. I ordered an Amaretto coffee to try to drown out the memory of the mushroom sauce, and was presented with a glass full of bitter black coffee into which the waiter poured a shot. I must have looked confused, because it was only on seeing my face that he said “Would you like cream?” I said cream would be lovely. Mistake. He went to the kitchen, came back with a can of squirty cream, and depressed the nozzle over my coffee for a generous count of a whole two seconds. Then ran off. The really weird thing about Lew Mar Nel’s is the more stratospheric bits of the wine list. They claim to have Robert Mondavi’s Cabernet Sauvignon for purchase in every year from 1966, the vineyard’s first year of operation; and Napa Valley’s Beaulieu Cabernet Sauvignon Georges de Latour Private Reserve in every year from 1957 ($1500 a bottle). Someone here, pyrex plates and all, is either taking the piss, or is a giant chancer; after all, who would order a wine like that in a place like this? Apparently, the Wine Spectator has given them a nod for their list six times (although it’s unclear whether or not that happened in this century). I’d actually suggest you pop in just to sit at the bar and soak up some of the old-time atmosphere and the bronze cowboy statues. Avoid the food, though – and let me know if you order any of those dizzying wines from the cellar. I’d be interested to hear whether or not they really exist. I don’t know whether it’s an effect of culture or genetics, but I’ve noticed that my taste for things which are simultaneously sweet and salty is one not shared by many of my European friends. At the same time, most of my Chinese relations and friends go a bundle for the combination. So over the holidays, hanging out with my Dad and brother (who like their popcorn at the cinema to be a mixture of the salty stuff and the sweet stuff, enjoy peanut brittle, sprinkle salt on guavas and will fight over Mexican candied mango seasoned with a chilli salt), it was inevitable that the snacks which repel my Mum and husband would come out to be nibbled over the sherry. Chinese candied olives are not something you’re likely to pick up at random while browsing the aisles if you’ve not tried them before, but they’re a great treat; if you like the salty/sweet flavour combination, I think you’ll enjoy them. 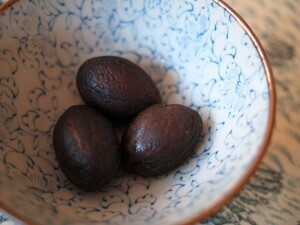 “Olive” is a bit of a misnomer; they’re not the same species as European olive (Olea europaea). These fruits are Canarium alba, and raw they’re a little like an avocado in texture and flavour, but their similarity in size, shape and their slight oiliness to a European olive is so marked that they’re often mistaken for the European version, especially once processed. That processing is done by soaking the fruit in a dense sugar and salt solution, then part-drying the result. You can buy these olives cracked, so the sugary brine really permeates the flesh, or uncracked for a less intense flavour. 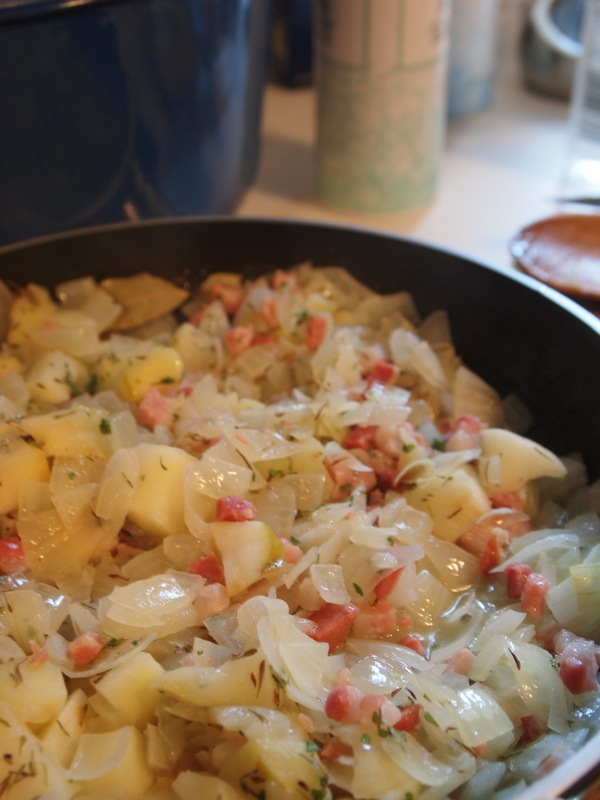 The resulting preserve is sweet, with a bit of a salty edge, and a lovely resinous, aromatic flavour. They’re great with a strong drink. 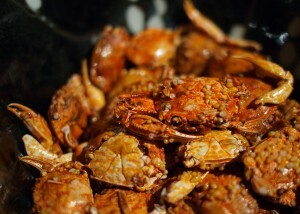 Caramel crabs, looking considerably better than they taste. Unfortunately, the caramel crabs I’d bought for drinky nibbles really required a very strong drink indeed before you might be able to manage to choke one down. I usually really rate candied dried fish (there’s a long Malaysian tradition of sweet, dried satay-spiced fish, tiny shrimp and cuttlefish), but this packet of Japanese baby crabs was a long way from being enjoyable. Sawagani are a tiny Japanese river crab, no bigger across the body than the tip of your finger. 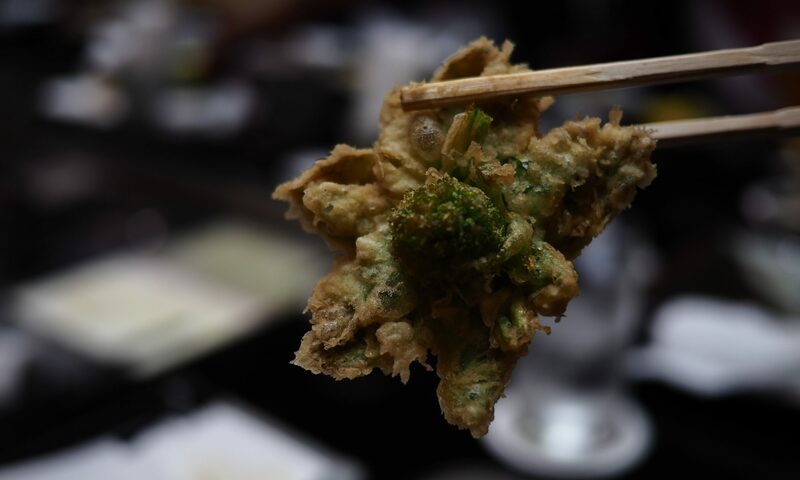 Some really good Japanese restaurants will drop them live into a deep fryer, and their carapace is so thin that when prepared in this way they turn out a bit like an eight-legged crisp. Was my packet past its sell-by date? Were my crabs elderly? It’s hard to say – I don’t read any Japanese (and stupidly, I threw the packet out before I had a chance to photograph it, so I can’t ask any Japanese-speakers here to help out), but these were a horrendously fishy little morsel, the shell beneath the layer of mustardy caramel a bit like eating the glaze from your Grandma’s best porcelain. Just say no to caramel crabs. It might be worth buying a packet, though, just to serve with a beer next time you have some friends round as a practical joke. If you’re anything like me, you’ll be feeling somewhat bloated and liverish after Christmas and New Year, so I’ll hold the roast goose recipe back until later in the week when our gall bladders have all recovered. 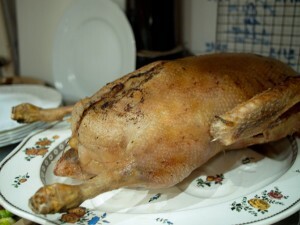 I was racking my brains for a nice easy recipe to start the year with – something that’s simple to prepare, and has few ingredients, but that tastes great and will impress guests or a picky family. 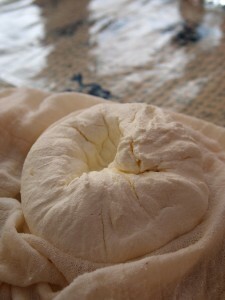 How about labneh, a soft “cheese” from the middle east, made in your fridge from thick Greek-style yoghurt? Greek yoghurt is thicker than the sloppy variety by virtue of having been strained until much of the whey drains out, leaving you with a richer, thicker product. Labneh takes the process further, continuing to drain until almost all of the whey has gone, and you are left with a thick, sharp-tasting ball that looks like soft cream cheese. It’s not a true cheese because rennet is not used in making it, but I like to use it where you might use something like Philadelphia – and when it’s made by the method below, with fresh garlic, you’ll find that it’s a mighty fine substitute for Boursin, richer, denser and without the dusty dried garlic taste you get in the packaged stuff from the supermarket. Labneh is a great addition to a cheeseboard, either in a chunk on its own or in a bowl, splashed with olive oil. Experiment by adding herbs to the garlic: for a Turkish flavour, try some dill and chillies; chop in some mint with the garlic for a Greek platter. My Mum made the labneh in the pictures at Christmas as part of a cold supper. It’s fantastic wherever you’d use cream cheese or with crudites, and great crumbled over rich middle-eastern dishes, especially those containing lamb; I’ve got a cheesecloth full going in the fridge at the moment which is destined to be spread on crusty bread and served with a Greek-style lamb shoulder. Line a sieve with a boiled cheesecloth, and put it over a bowl to catch drips. 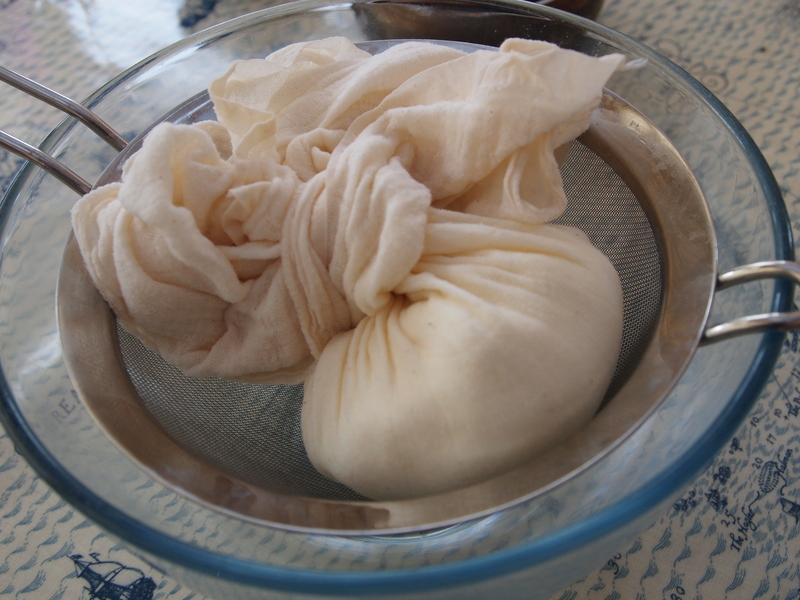 You can also use a boiled kitchen towel if you don’t have a cheesecloth – an old linen one which has been washed many times will be softer and easier to work with. Stir the yoghurt, salt and garlic well in a bowl to make sure everything is well combined. You can leave the garlic out if you want a plain labneh; the garlic gives a lovely fiery kick to the finished cheese. Pour the yoghurt mixture into the lined sieve, bring the corners and edges up to form a bag around the labneh and twist together. You can secure the twist with string if you like, but it’s not really necessary. Put the bowl and sieve into the fridge and leave the labneh to drain for between 24 and 48 hours, squeezing the bag every now and then. The cheese will be a pleasant, creamy texture after 24 hours, and leaving it for longer will make it even stiffer, and harder to spread. To keep your labneh in the fridge, cover it completely with olive oil in a bowl. It will keep for two weeks, but I bet you won’t be able to stop yourself finishing it much sooner than that.